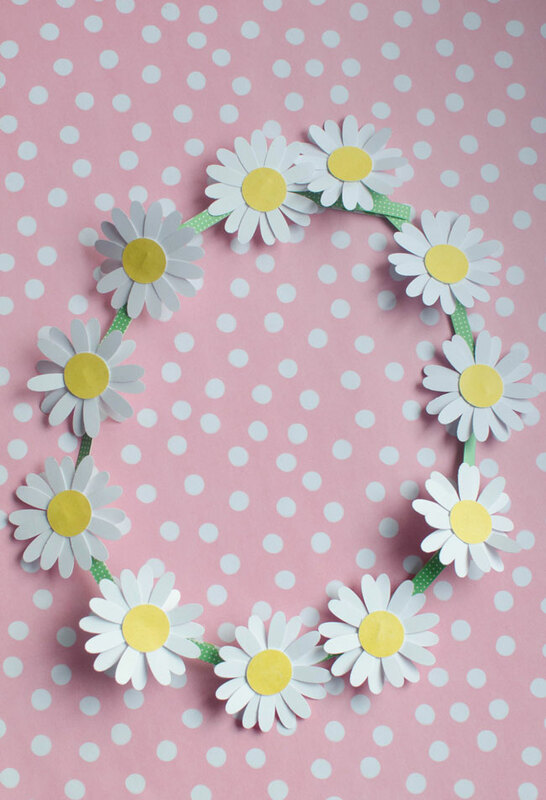 Seeing all of the flowers springing up has me dreaming of warm picnics and long, flowy daisy chains. 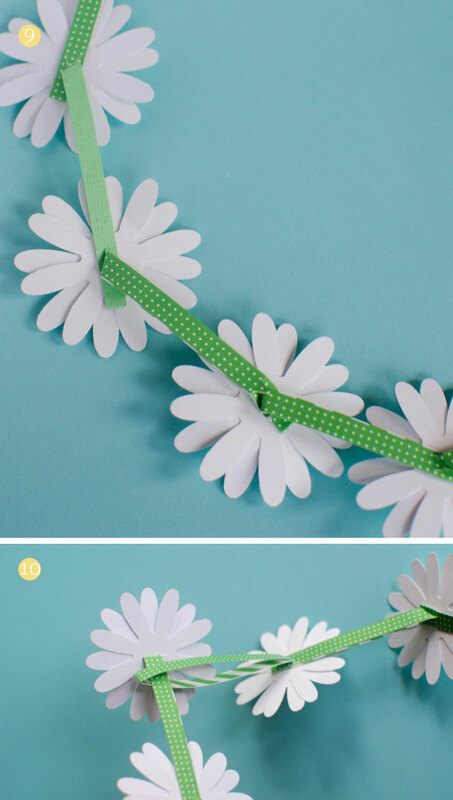 Have you ever made a daisy chain? They are so simple and lovely that I decided I couldn’t wait for the daisies to start popping up. 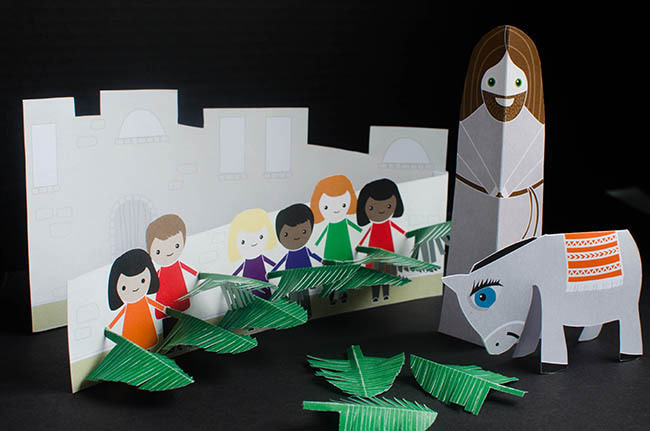 This simple paper craft simulates the nature craft I grew up with, but with paper (which means it will last longer and won’t wilt!). 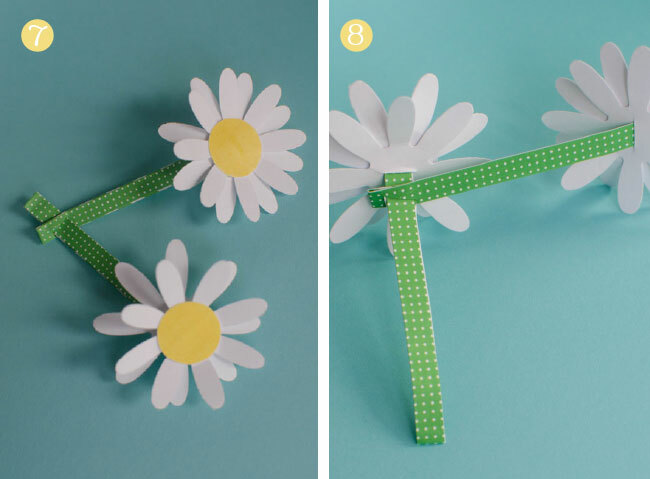 Step 1: Stack two daisy petal cutouts and rotate them so that they are not stacked directly on top of one another. Then use your craft knife to cut a slit in the center of the petal, being sure to cut through both layers at the same time. 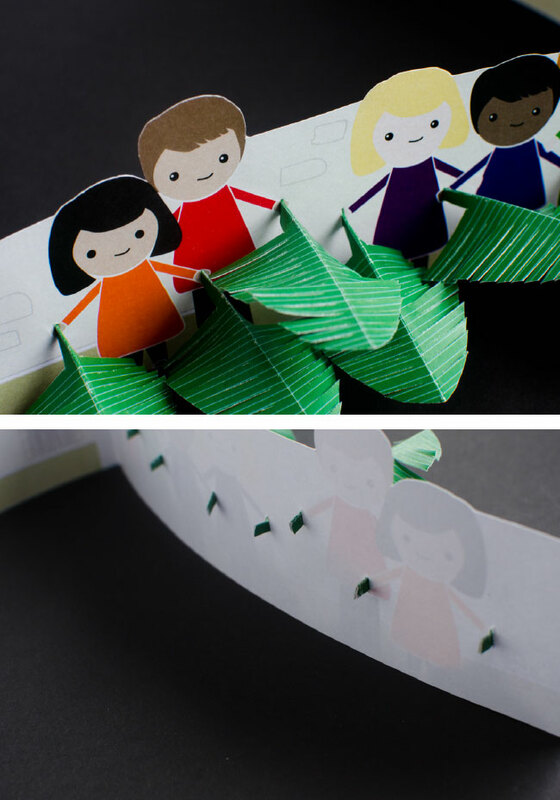 Step 2: Fold your green paper strip in half. Step 3: Carefully insert the cut edge of the green strip through the slit that you made. You should have about 1/4″ of the green paper coming through the top of the flower. 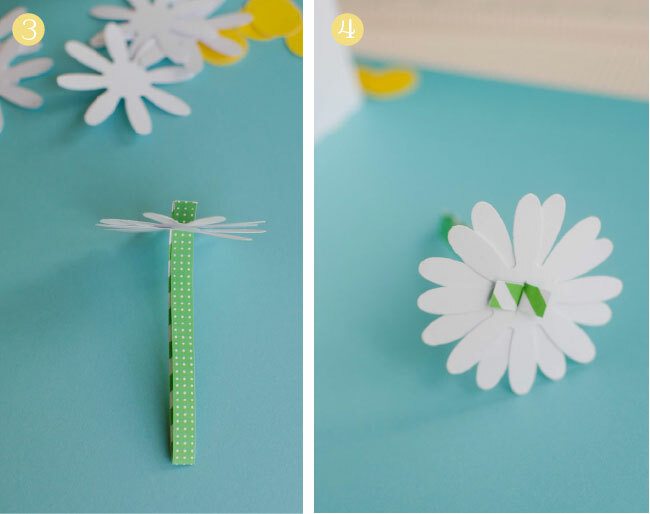 Step 4: Fold the green paper back onto the petals as shown in the image above, and glue into place. Step 5: Glue yellow dot on top of the flower petals so that they completely cover the green paper, and pull some of the petals forward so that the flower isn’t quite so flat anymore. Step 6: Using your craft knife, carefully cut two slits towards the bottom of the “stem” so that they form an X (on subsequent stems you will want to hold off on this step until you are ready to push the next flower through). 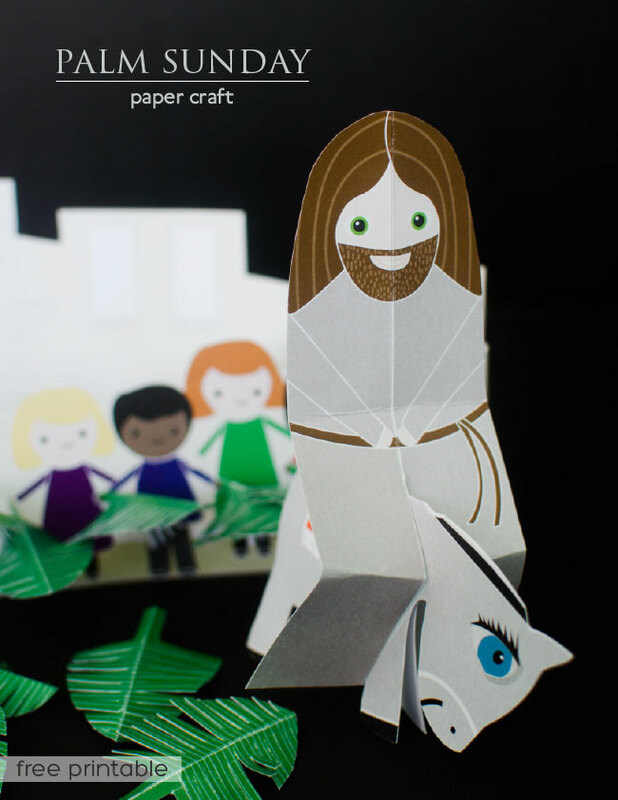 Be very careful not to get too close to the edges of the paper, but you need the slits to be long enough to accommodate the 1/4″ stems. Step 7: At this point you need to go ahead and make another flower. Insert the stem of the new flower into the slits you cut in the first stem. Step 8: Pull the flower through the stem of the first all the way up to back of the petals. 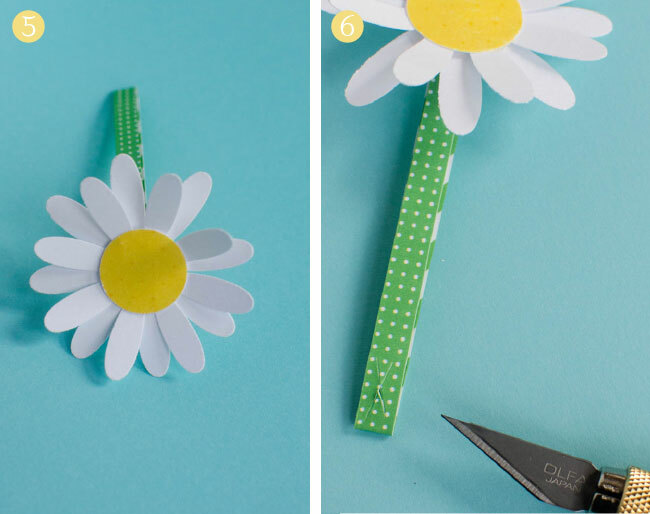 Step 9: Continue adding daisies until you reach your desired length. My Step 9 image shows how the back of the chain should look. 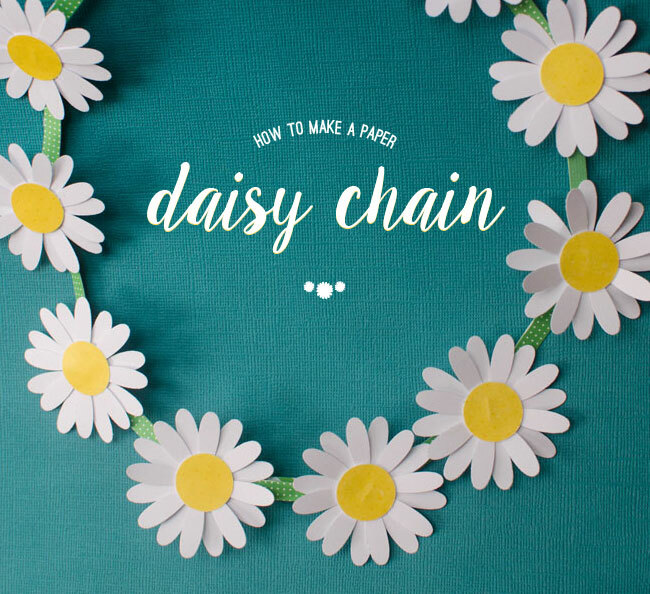 Step 10: When your chain is long enough, you can close it by simply sliding the first daisy through the loop of the stem of the last (note: you won’t need to cut slits in the stem of the last daisy). 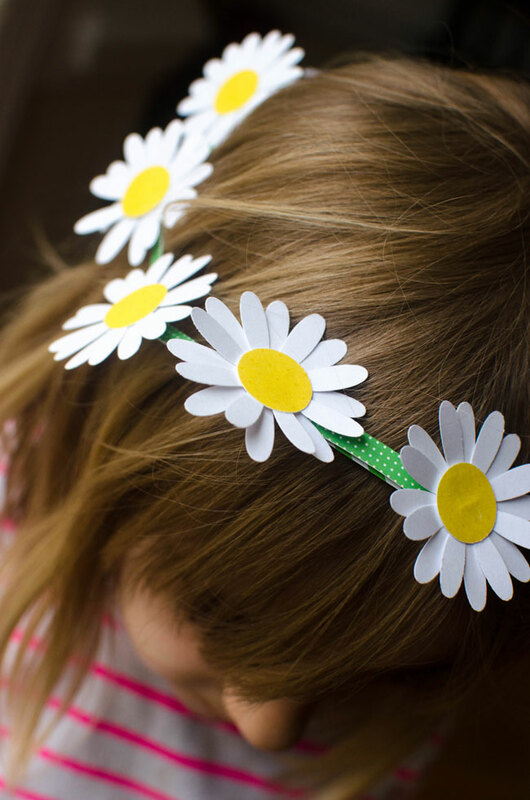 Another really fun way to wear your daisy chain is as a crown. My girls instantly wanted to place it atop their heads and it looks so sweet this way. A smaller chain works best for this purpose. 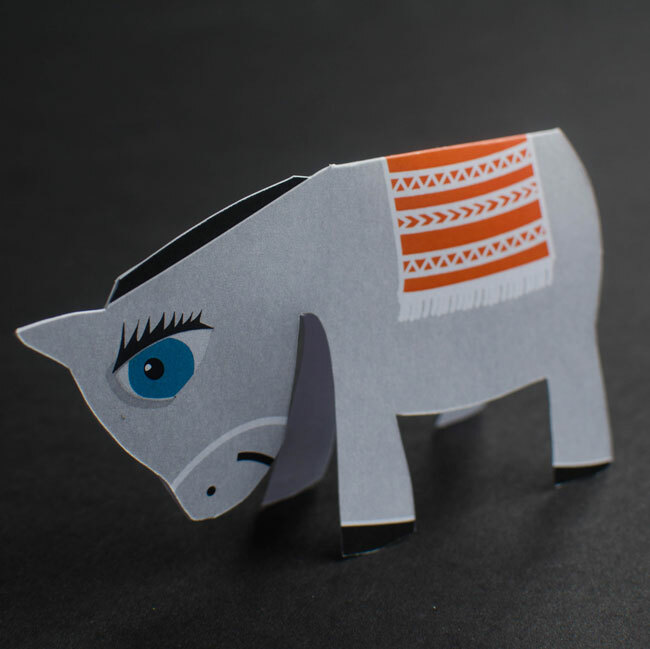 Ok, so this paper craft looks way too fun and you want to get started right away, but you don’t have paper punches or the right colored paper. I hear you! 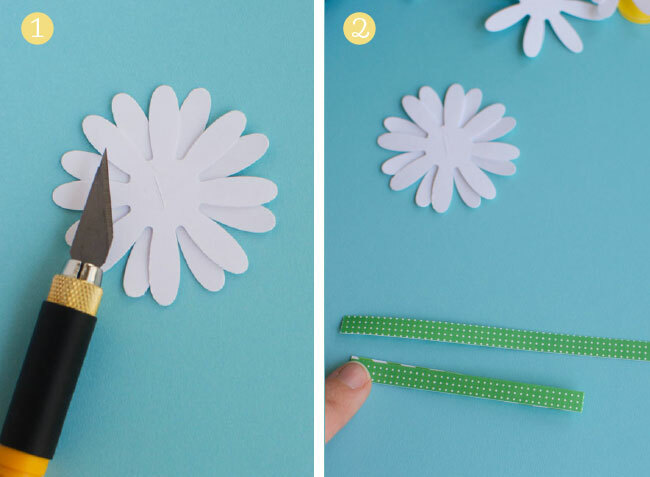 I have put together some templates and printable papers for you to use if you want to break out the scissors and cut your way to a perfectly lovely paper daisy chain. Enjoy the freebies for your personal use and happy crafting! 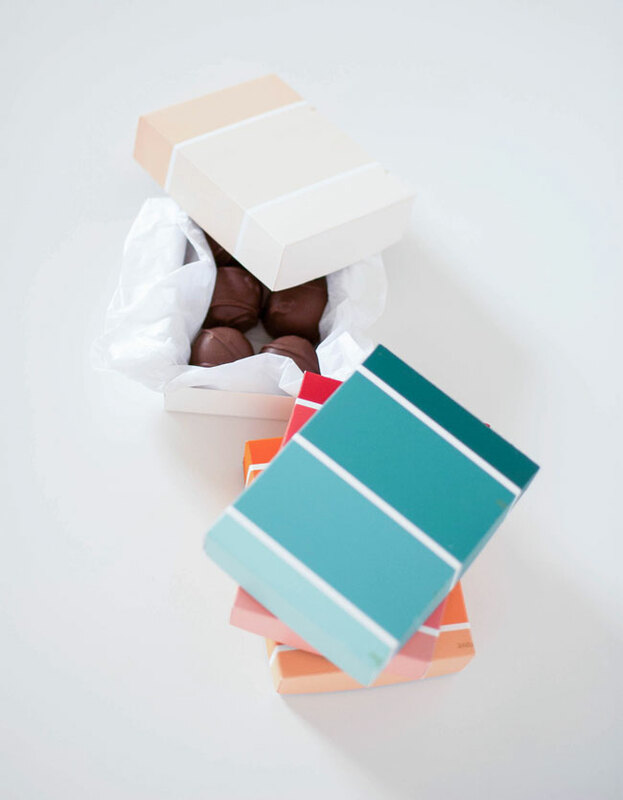 It’s easy to see why simple hardware store paint chips are a favorite among crafters. They’re vibrant, come in any color you need, and incredibly versatile. 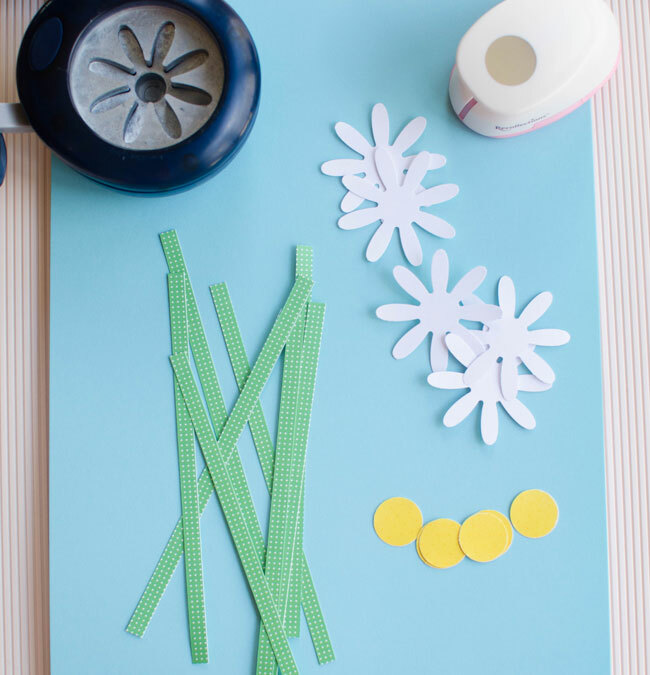 Today, we’re going to show you a simple paper craft that you can make using paint chips. The samples shown are from Home Depot. The Behr paint chips are wonderful for making boxes because of they’re nice and big. Plus, they’re shaped very nicely for boxes, being a wide rectangle as opposed to some of the more narrow ones. Step 1: Use your bone folder and a ruler (or scoring board) to score lines 1 inch from the sides as shown. Step 2: Cut four slits following the lines on the sides only. 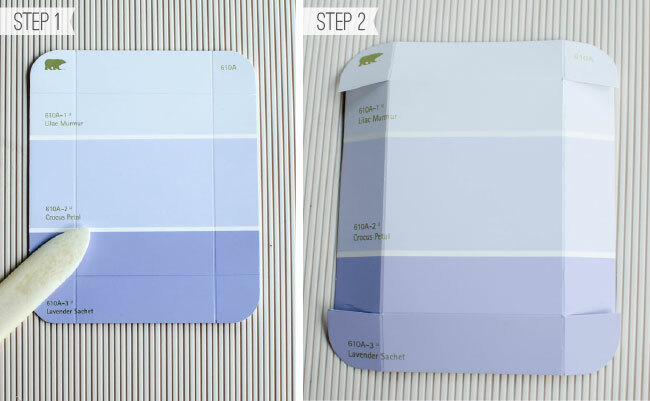 Fold all of the sides inward toward the back of the paint chip. 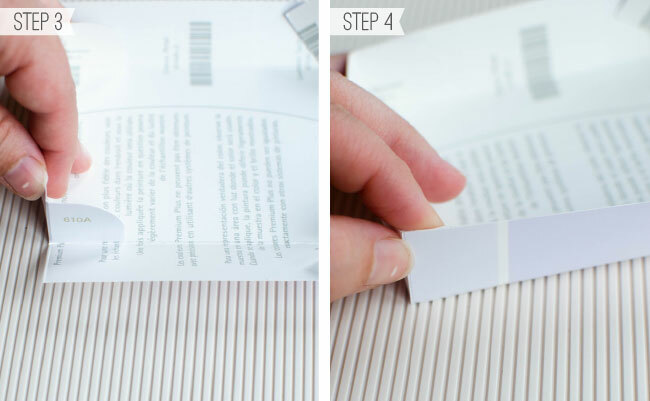 Step 3: Fold top and bottom toward the back of the paint chip so that you have a little flap (see photo above). You will need to add glue to each of the flaps. Step 4: Bring sides up to flaps and hold until the glue sets and sides are stable. Step 5: Repeat the steps above with a new paint chip, but this time you need to go just slightly past the 1 inch mark when marking your lines. 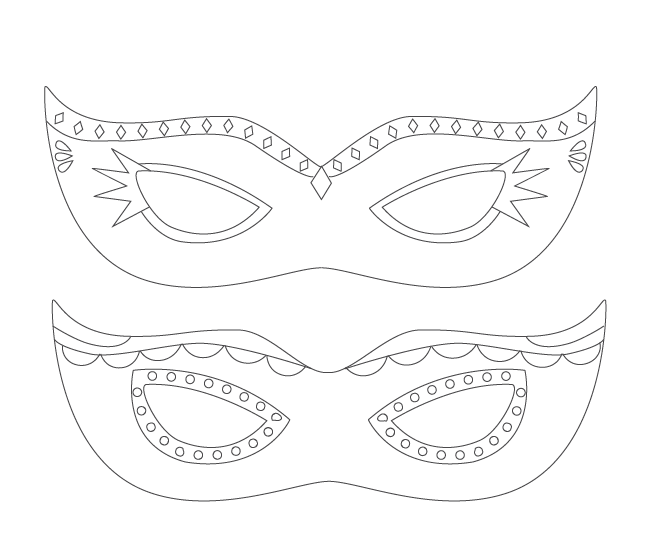 This will make the bottom slightly smaller than the top so that they fit together nicely. 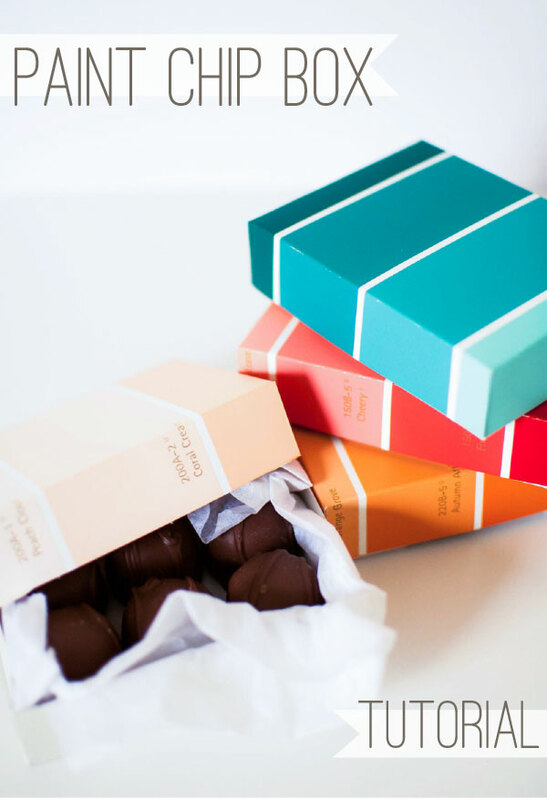 Now you can add some tissue paper and some delicious candies to gift to your favorite people. 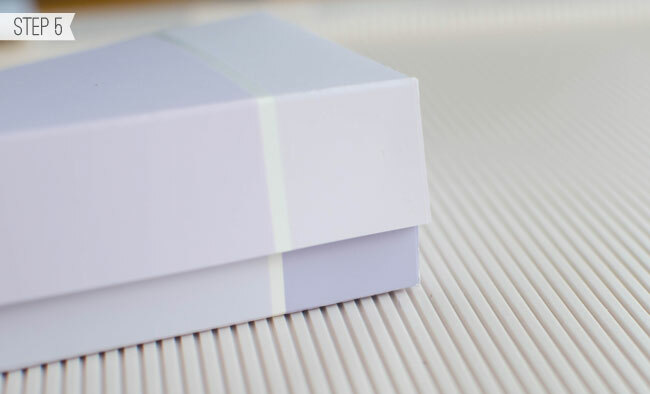 These boxes make up really quickly so you’ll be able to make lots!